This long off-the-shoulder mermaid military ball dress is sensationally sophisticated and sure to stun the crowd at prom, a military ball, or a black-tie gala. This princess-cut formal evening gown is crafted from wrinkle-resistant shiny mikado material that provides a figure-flattering fit and subtle sheen. 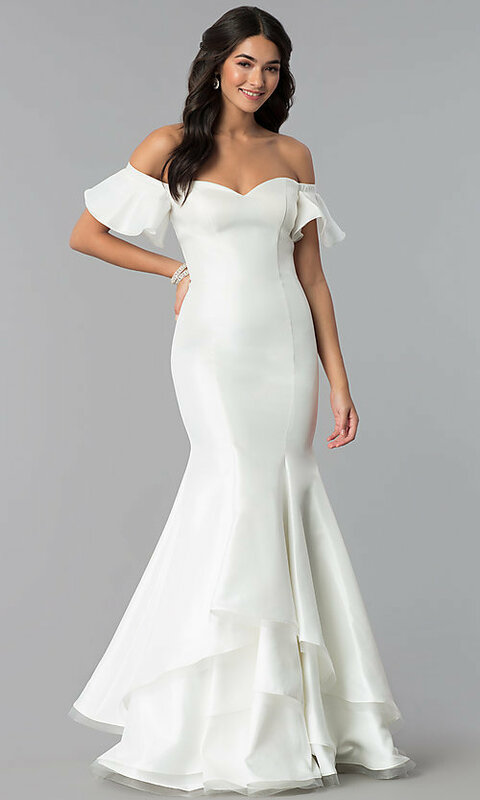 The off-the-shoulder sweetheart neckline is adorned with elasticized ruffled sleeves that add to the ultra-flirty vibe of the military-ball mermaid dress. The romance continues as a slight spin reveals a corset-back detail. Gently cradling the curves through the hips before flaring out to a full floor length, the long mermaid skirt features a tulle lining, tiered layers, and a horsehair hemline. Priced under $200, this off-the-shoulder military ball dress is an exquisite, yet affordable choice for portraying a red-carpet look at your next formal event. The model wearing off white is 5'9" and wearing 4" heels.